Running a business and launching new products isn’t always easy. There are tons of requirements which need to be fulfilled before your business becomes popular. The question which usually pops up in our mind is; how can you possibly make your product or business familiar with the customers? Right? Well, the answer is quite simple – ADVERTISING. It is quite mandatory to make your business successful and popular among clienteles and customers. And advertising is one way to do that. With the robust advancement and progression in terms of technology, there are numerous platforms introduced which are perfect for advertising. Choosing the right advertising medium for your company can be quite a challenge. After all, there are so many of them these days that the decision becomes really hard. The two main ways of advertising are the typical traditional way and the social media advertising. Even though traditional advertising has worked for a lot of companies for several years but ever since the launch and establishment of social media networks, most of the companies usually prefer social media for advertising rather than traditional advertising. 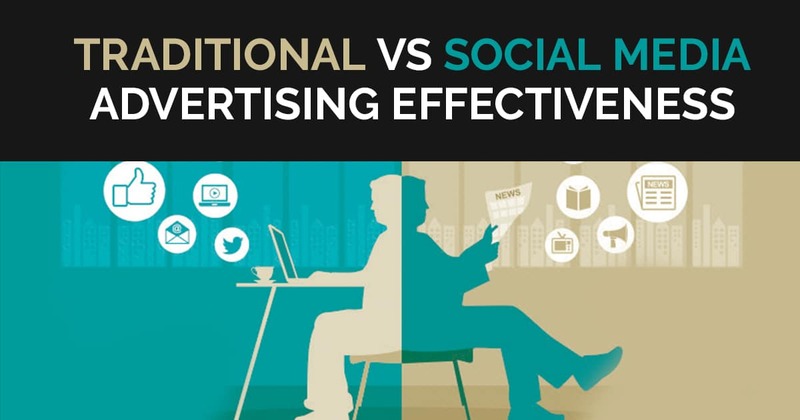 Here is a comparison between traditional vs. social media advertising, let’s see which one works best. Is social media more effective? We are living in the world where social media has somewhat almost taken over. Everyone is connected through the big social media platforms like Facebook, Twitter, Instagram and much more, which is why social media seems to be more effectual for advertising. Traditional advertising on the other is not as much effective. Mainly because traditional marketing means advertisement of your company through the broadcast. Even though the intention is to convey the message to as many people as possible but there is always a possibility that the customers or target clients aren’t connected to the traditional advertising network which leaves less chance of people actually seeing your ad. If you want a cheaper and a lot more convenient way to advertise then opting for social media platforms is the best option. Other than this you can also figure out the digital marketing ROI which will make your investment in the social media more valued. The CPM (cost-per-thousand impressions) of social media is less than 3 dollars while on the other hand radio has a CPM of ten dollars. This makes social media less expensive than the traditional advertising. As far as traditional advertising is concerned, it isn’t as accurate as the social media advertising. Why? Let’s take an example of cannon and laser. Traditional advertisement sort of uses a cannon to fire the messages, hoping that it is actually conveyed to the target customers. While on the other hand, the social media targets the related clients with the precision of a laser. The main purpose of giving this example was to explain that social media is a lot more accurate than traditional marketing. Social media advertising allows the customers to actually see the details, images, and positive and negative reviews of a product before purchasing it. While traditional advertisement doesn’t. Social media gives a full opportunity to the customers to know everything about the product that is necessarily making it easier for the customers to choose the product. These are a few points which clearly indicate that how important social media advertising actually is. Ever since the advancement of technology and the robust growth of the social media platforms, the advertisement has become quite easy, effective, cheap and convenient. To read more such articles, stay connected.